Max von Delius is Professor of Organic Chemistry at the Institute of Organic Chemistry and Advanced Materials of the University of Ulm. He studied chemistry at Friedrich-Alexander University (FAU) in Erlangen and at Louis-Pasteur University in Strasbourg (France). He obtained his PhD from the University of Edinburgh (Scotland) and was a Leopoldina postdoctoral fellow at the University of Toronto (Canada). In 2018, Max von Delius was awarded the Hoechst Dozentenpreis and from July 2019 his research activities will be supported by the European Research Council (ERC starting grant). Our research activities are positioned at the interface of supramolecular chemistry, dynamic covalent chemistry and the synthesis of functional materials. One central goal of our group is to study complex chemical networks at equilibrium and beyond (systems chemistry). We are also active in the field of functional organic materials and synthetic carbon allotropes, where we seek to apply the synthesized compounds in new-generation solar cells and photocatalysis. Coworkers in the Delius group will be trained in all aspects of synthetic organic chemistry (synthesis, purification, literature research), supramolecular chemistry (screenings, titrations, crystallisation), as well as analytical chemistry (NMR, MS, HPLC, LCMS, GC). 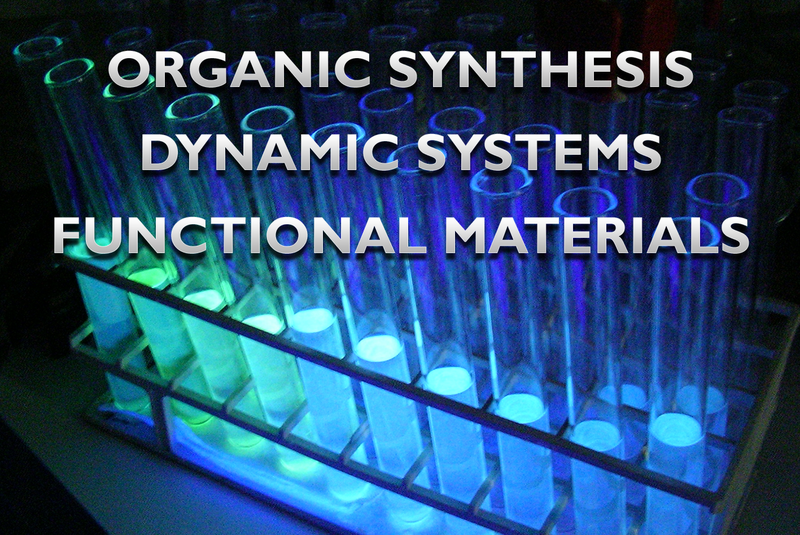 Our research on systems chemistry will contribute to a better understanding of highly complex systems in nature and we are working towards practical applications in molecular sensing and organic electronics. This summer term we will have the following distinguished guest speakers visit our institute: Dave Leigh (May 2, Uni Manchester), Johannes Teichert (May 24, TU Berlin), Michael Sommer (June 21, TU Chemnitz) and Peter Schreiner (July 5, Uni Gießen). Congratulations to Oleksandr and our collaborators at MPI Mainz (PI: Frederik Wurm) on the publication of our work on Polyorthoesters as Degradable PE Mimicks in Macromolecules. Congrats to Oleksandr Shyshov who was awarded a Springer Poster Prize at SupraChem2019 Würzburg for his work on the supramolecular chemistry of all-cis hexafluorocyclohexane derivatives! Congrats to our MSc student Julian Vogel who has been awarded a scholarship for his MSc project by the Stiftung Industrieforschung! Max von Delius has received the prestigious Hoechst Dozentenpreis in Düsseldorf in the presence of the who's who of German chemistry (academia and industry)! To acknowledge the creativity and hard work by past and present team members, they will get a share of the prize (ski trip to Austria in March 2019). We inaugurated an amazing piece of art tonight in Ulm: a giant, fluorescing Erlenmeyer flask! Perfect outreach for our transregional SFB CataLight. Check out the pictures at SWP and Uni Ulm. Mark your calendars - this winter term our institute will host the following speakers: 05.11.2018 Ivan Aprahamian (Dartmouth), 08.11.2018 Marcin Stepien (Uni Wroclaw), 09.11.2018 Kathleen Mullen (QUT Brisbane), Bryan Koivisto (Ryerson) and Jochen Niemeyer (Uni Duisburg-Essen), 29.11.2018 Frank Würthner (Uni Würzburg), 07.12.2018 Andreas Herrmann (Firmenich SA), 11.01.2019 Peter Huy (Uni Saarland). Bryan Koivisto from Ryerson University (Toronto, Canada) joins our Institute as a Visiting Professor. Great to have you here, Bryan! February 2019: Sugiyasu and colleagues used high-speed AFM to directly observe and manipulate supramolecular polymerization! January 2019: Aida and coworkers report the demonstration of a mesophase transition in a hybrid material of a columnar supramolecular polymer and a liquid crystalline material. December 2018: Bach and colleagues demonstrate an ingenious use of "supramolecular photosensitization" for achieving the deracemization of chiral allenes by visible light. November 2018: Stupp and coworkers found a supramolecular sweet spot (strong enough, yet not too strong) in their DNA-peptide fibrous superstructures that are still dynamic after self-assembly. October 2018: we are just as excited as Derek Lowe about two papers (Pantelic, Gonen) demonstrating that electron diffraction ("micro-ED") can be used to elucidate the structure of small molecules, circumventing the need to grow sizable single crystals. September 2018: we were equally surprised and excited to see a paper on the fight against "Inter-Galactic Parasites" based on a tool called "MORTY", authored by Beth Smith at the Sanchez Institute.